Double world champion Sebastian Vettel won the Korean Grand Prix in crushing fashion on Sunday to help his Red Bull team retain the Formula One constructors’ title after a dominant season. Vettel started second on the grid, but took the lead from Briton Lewis Hamilton of McLaren on the opening lap to pull clear and produce a flawless drive to the chequered flag. He came home in a winning time of one hour, 38 minutes and 1.994 seconds, 12.019 ahead of Hamilton, who drove a splendidly controlled defensive race to stay ahead of Vettel’s Red Bull team-mate Mark Webber. The Australian finished third, ensuring Red Bull clinched their second successive team title, ahead of Briton Jenson Button in the second McLaren, and two-time champion Spaniard Fernando Alonso of Ferrari. Vettel delivered a final flourish with the fastest lap of the race on his last circuit as the top five were separated by just 15 seconds. Felipe Massa was sixth in the second Ferrari ahead of Jaime Alguersuari of Toro Rosso, Nico Rosberg of Mercedes, Sebastian Buemi of Toro Rosso and British rookie Paul Di Resta, who grabbed a point for Force India team in 10th place. Seven-time champion Michael Schumacher, 42, was forced into an early retirement after his Mercedes car was damaged in a collision with Vitaly Petrov of Renault, for which the Russian apologised. 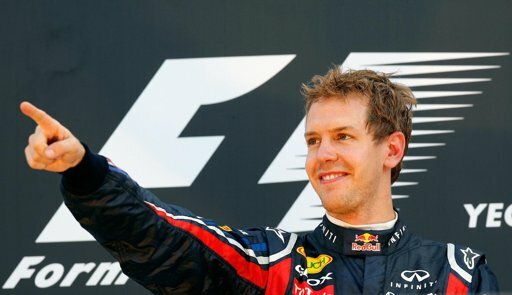 Vettel showed no sign of easing off as he bids to equal Schumacher’s record of 13 wins in a season. “I think it’s good to see the whole team keeps pushing,” he said. Horner hailed the team’s “unrivalled” team spirit. “A second title is testimony to the dedication and commitment of the whole team. We’re going to enjoy this moment — it’s been a phenomenal period for the team,” he said. On a cool, grey day with intermittent drizzle, the race started in dry conditions with Hamilton leading off the grid from his 19th pole position. Behind him, the field squeezed up through the first two corners feeding into the long back straight where Vettel pulled into Hamilton’s slipstream. Having set himself up, the new double champion exploited his position with a bold passing move under braking into turn four. The Red Bull swiftly opened up a 1.2 seconds lead, Hamilton having given no resistance. Button also made a poor start and fell to sixth on the opening lap as the leaders jostled for places, and by the start of lap two Vettel led Hamilton ahead of Webber, Massa, Alonso and Button. The order remained unchanged until lap 14 when Button pitted first ahead of Rosberg. On release, they ran side by side with Rosberg narrowly ahead in the pit lane before Button conceded position, only to regain it immediately as Rosberg appeared to falter in the fray. Hamilton pitted a lap later and was followed in by Vettel, Red Bull immediately covering the Mercedes strategy before an uncontrolled attack by Vitaly Petrov saw him slide into Schumacher at turn three on lap 17. The Renault driver slammed into the back of the old champion’s Mercedes, causing serious damage to both cars. Schumacher lost his rear wing and suffered a puncture and had to retire on track. Petrov limped to the pits before abandoning his race with broken steering as the safety car came out for three laps. On resumption, Webber resisted a charge from Button as the order resettled with Vettel 1.4 seconds ahead of Hamilton, Webber and Button, up to fourth. Webber then closed on Hamilton and began a series of attempts to pass him, with thrilling wheel-to-wheel racing on lap 33 as they interchanged positions before both pitted and, within a lap, resumed their battle. But the duel cost both drivers time and allowed Vettel to pull clear by more than 10 seconds. The scrap for second also encouraged Button, in fourth, to close the gap with Alonso hot on his tail. Again and again, they scrapped and challenged, but in the dramatic action Hamilton hung on and behind him each driver did the same. “I give up!” said Alonso at one point, in a radio comment in English — designed, it was suggested, to encourage McLaren to relax. Button did not and nor did Hamilton, but it was Red Bull whose points carried the day and the season.